Rapper's Delight was the very first rap record to cross over to pop in 1979. It was actually the second rap record released. Like doo wop in the 40s, rap started in the streetcorners of Harlem in New York City. Sylvia Robinson was best known as one half of Mickey and Sylvia and for the hit single Pillow Talk. But with her husband Joe she also had success as owner of All Platinum Records, especially The Moments. Sylvia was aware of street rappers and she wanted to record them. So she started Sugar Hill Records with funding from Roulette Records owner Morris Levy. At first she had trouble finding rappers willing to record. Some rappers thought rap should only be live. Sylvia's son heard a rapper at a pizza place. He went there to find him. That was Henry "Big Bank Hank" Jackson. Guy "Master Gee" O'Brien worked in the pizza place. When he saw this, he auditioned too. And so did Michael "Wonder Mike" Wright. Sugarhill Gang was born. Rapper's Delight is based on Chic's Good Times. When Chic's Nile Rodgers found out, he sued Sugar Hill. Rodgers says he likes the record. He just wanted proper credit. The band on the record is Positive Force. Rapper's Delight reached #4 on the R&B Singles chart and it was also a hit in England. Then it crossed over to pop and it reached #36 on the Billboard Hot 100. And the term "hip hop" came from Wonder Mike's rap at the start of the song. Sugarhill Gang recorded four albums and some of their singles were successful on the R&B and dance charts and in Europe. Of course rap became this big thing. Sylvia Robinson deserves most of the credit for having the vision to record rap in the first place. Rapper's Delight was so successful she was able to buy out Levy. Henry Jackson died in 2014. 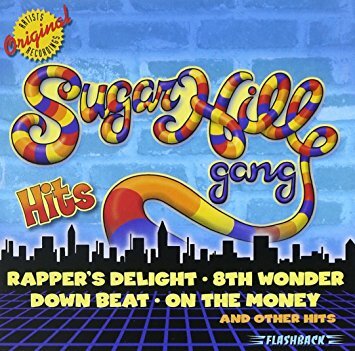 But Sugarhill Gang toured last year. You can get all their hits on this Rhino budget comp. 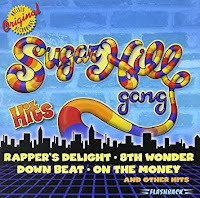 Here's the video for Rapper's Delight by Sugarhill Gang. I always wondered exactly how Rap started. I did hear about the Sugar Hill Gang, but never knew their story. Thank-you very much Frank for the detailed history.